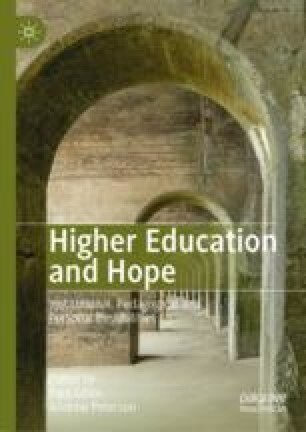 This chapter argues that there is a link between critical thought and the ability to remain hopeful even under highly problematic conditions like the neoliberal environment of contemporary higher education. It discusses Hannah Arendt’s and Richard Rorty’s reflections on thinking and hope and suggests that despite their different starting points, the two authors share much. In particular, it is argued that both Arendt and Rorty reiterate the idea of Socratic irony and maieutic in a twentieth century context. Towards the end of the chapter, Rorty and Arendt are also brought into disagreement. Because of its adherence to facts and events, it is argued, Arendt’s thought is better able to produce meaningful criticism of existing conditions, accompanied with hope for changing them. Degerman, D. (2016). Within the Heart’s Darkness: The Role of Emotions in Arendt’s Political Thought. European Journal of Political Theory. Published Online Before Print, May 18. https://doi.org/10.1177/1474885116647850. Guaraldo, O. (2018), Public Happiness: Revisiting an Arendtian Hypothesis. Philosophy Today, 62(2), 397–418. Online Before Print, June 12. https://doi.org/10.5840/philtoday201866218. Tampere3. (2018a). Belief in humanity, belief in academic rigour—Tampere Universities. YouTube: https://www.youtube.com/watch?v=H3NAkSCWZVQ. Accessed February 27, 2019. Tampere3. (2018b). www.tampere3.fi. Promotional webpage (no longer accessible). Partly available through http://web.archive.org/web/20180826142414/; https://www.tampere3.fi/en/. Accessed February 27, 2019. TUNI. (2019). Key Information—Our Strategy. https://www.tuni.fi/en/about-us/key-information#show-education-strategy-of-the-tampere-university-community--id2868. Accessed February 27, 2019. Williams, R., & Leahy, A. (2018). U21 Ranking of National Higher Education Systems. Universitas 21. Available at https://universitas21.com/sites/default/files/2018-05/U21_Rankings%20Report_0418_FULL_LR%20%281%29.pdf.